Growing Vegetables in Containers - Container vegetable gardening savvy. Growing Vegetables in Containers is a great way for anyone to grow their own crisp vegetables regardless of space allowances. Container vegetable gardens can be big or small; indoors or out; one plant or many. Gardeners with limited space have great success growing vegetables in containers and those with mobility issues can create an easy to access vegetable oasis. Many common vegetables such as greens, tomatoes, peppers, cucumbers, and even root vegetables can be easily grown in containers. Bring the vegetable garden to your doorstep with a variety of container shapes and sizes. Going green with container vegetable gardens. Select the vegetables for your container garden. Choose planters, boxes and other vessels sized appropriately for each vegetable type. Fill with a rich and nutritious growing medium, add compost. Place the container in a location that receives adequate sun for the plants you'll be growing. Water thoroughly and regularly using a "compost tea" every second watering. Enjoy the fruits (or vegetables) of your labours! 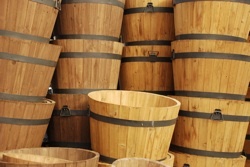 The success of your container gardening venture will depend largely on container choice. The right pot size is extremely important when growing vegetables in containers. A container that is too small will constrict the roots, dry out too quickly, and reduce overall yields. It's far better to have a container that is too large than too small. Greens have shallow root systems. They do well in bowl shaped containers that are about 12 inches deep at the center and have a large planting surface. When growing tomatoes in containers, remember they have deep roots. Look for foam containers that look like stone to reduce weight. Glazed ceramic works well for tomatoes and peppers but the pots are very heavy. Any container used for tomatoes will require a trellis or tomato cage. Tomato and pepper containers should be at least 24 inches deep and 18 inches across. This is enough for 1 tomato plant or two pepper plants. Cucumbers do well in hanging baskets or tall planters. Instead of trellising them, allow the plant to drape over the sides of the planter. This makes for easy harvesting and allows for ideal airflow. Growing vegetables in hanging planters reduces soil borne diseases as the fruits never come in contact with the ground. 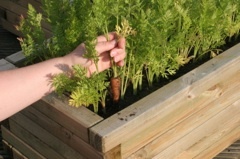 Root vegetables need ample depth to allow the plant to reach full size. Choose a hardy container with straight sides and at least a foot of leg room for tap root type veggies like carrot and parsnip. Beets make a fantastic container grown vegetable because the tender new greens are delicious steamed and in salads and once they're gone the root plumps up to perfection. Root vegetables last for months in cold storage and can be canned, frozen or pickled. Potatoes can be grown in plastic garbage cans. Cut holes in the bottom of the can for drainage. Fill the garbage can about 1/3 of the way up with soil. Add the seed potatoes. When the plants have grown about 12 inches tall, add a layer of clean hay or straw (no weeds) up to the first set of leaves. Continue this process until the can is full and the potato plants are at the top of the garbage can. Be sure to plant in full sun. The entire garbage can will be filled with potatoes at harvest time. You aren't restricted to one plant type per container either. Tomato, cucumber and sweet pepper in a large container with a cage in the middle. Beans, beans... 3 pole bean plants surrounded by bush beans. Making use of the vetical space can more than double your vegetable growing area and visually dress up a ho hum patio. Tools for container gardening are simple. Use a hand trowel to fill the pots and add plants. Weeding is not usually an issue with container gardens. If weeds do rear their ugly little heads, just pull them out. A pair of good garden scissors is necessary for harvesting. Other tools are a paint brush for vegetables grown indoors or under covers. Use the brush for pollination. For gardens with a lot of containers, a drip watering system will make your life easier. Ultimate Drip Irrigation Kit for Container Gardening . If you only have a few plants, then water them gently with a hose or watering can. A small spray bottle may be necessary if bugs start to eat your plants. Most garden pests can be controlled using organic vegetable gardening techniques. Fabric used for row covers in large gardens can be used for containers. Make a frame out of an old wire hanger and drape garden row cover fabric over the frame. Hold fabric to the frame with spring clamps or clothes pins. Lightweight cheesecloth is a cheaper alternative. This will keep garden pests such as flea beetles off of your plants. To protect plants from early or late frosts, the same wire frame can be used to hold protective plastic. Check out our container gardening supplies page for more information on appropriate tools for growing vegetables in containers. Some vegetables are not well suited for growing in containers. Corn, most winter squash, large melons, asparagus, artichokes, and prize winning pumpkins are not going to do well in containers. These plants are just too expansive and large to be confined to a small space. When choosing a vegetable plant for a container garden, select bush varieties over vines and pole varieties. Choose mini versions of pumpkins and squash. 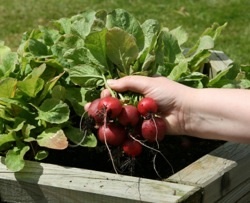 Small root crops like radishes do very well in containers. Avoid daikon radishes as the huge root requires a large container. Growing vegetables in containers is a fun and easy way to add space to any garden. Using containers will allow those in apartments and condominiums to have fresh homegrown vegetables all summer long. Just pick a couple of your favorite veggies, plant them in an attractive container and you have an instant vegetable garden. Visitors to our Growing Vegetables in Containers page may also be interested in the following pages.